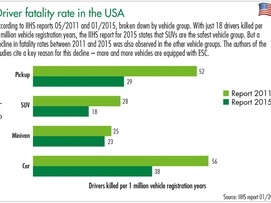 With regard to vehicle safety, the studies conducted by the IIHS in the USA into the number of drivers killed in car accidents per million vehicle registration years also offer some interesting insights. 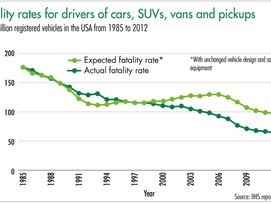 The first study, which was published in 1989, looked at cars only. The follow-up studies look at all varieties of “passenger vehicles” (cars, vans and pickups). The basic data used for the calculations are the numbers of fatally injured drivers registered in the Fatality Analysis Reporting System (FARS). The FARS database, which is managed by the National Highway Traffic Safety Administration NHTSA, is a full census of fatal accidents in 50 US states, the District of Columbia and Puerto Rico. FARS contains accidents that occurred on public roads, involved a motor vehicle and resulted in the death of at least one road user within 30 days of the accident occurring. The analyses conducted by the IIHS record only the number of drivers killed because the number of occupants is not known. The annual vehicle populations (national vehicle population profile), categorized according to brand and model series, are used as reference variables for the IIHS analyses. One criterion for being included in the studies is that at least 100,000 vehicles of a specific model series must have been registered in the period under analysis. If a particular model is modified during the year to such an extent that this has a significicant impact on the vehicle design and safety equipment, the fatality rate is not calculated until the year following the change. 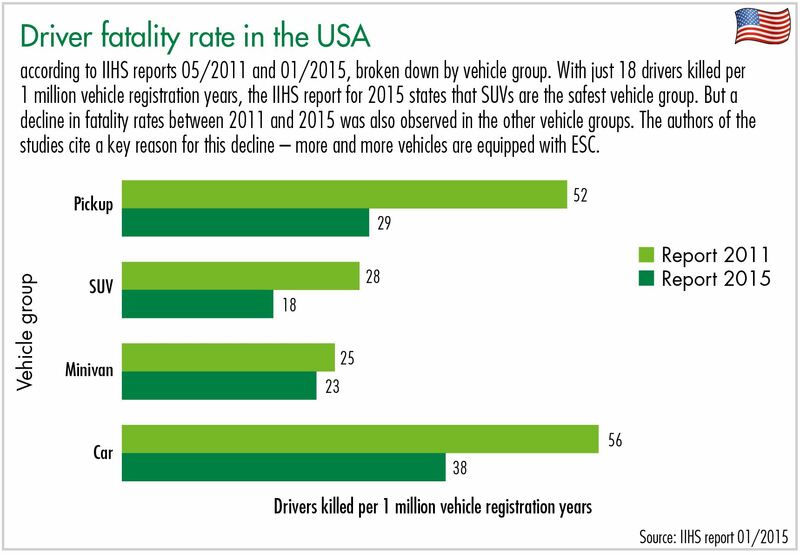 A key result of the IIHS studies is the historical trend in driver fatality rates for cars per million registered vehicles from 1985 to 2012. The studies illustrate the trends in the actual rate and expected rate, with unchanged vehicle design and safety equipment. It is noteworthy that the curves up to 1998 lie very close to each other and, at certain phases, the actual fatality rate is higher than the expected rate with unchanged design and equipment. The authors of the study therefore conclude that the safety of the entire vehicle fleet in the US did not improve to any great extent, at least not initially. But things changed significicantly in later years. 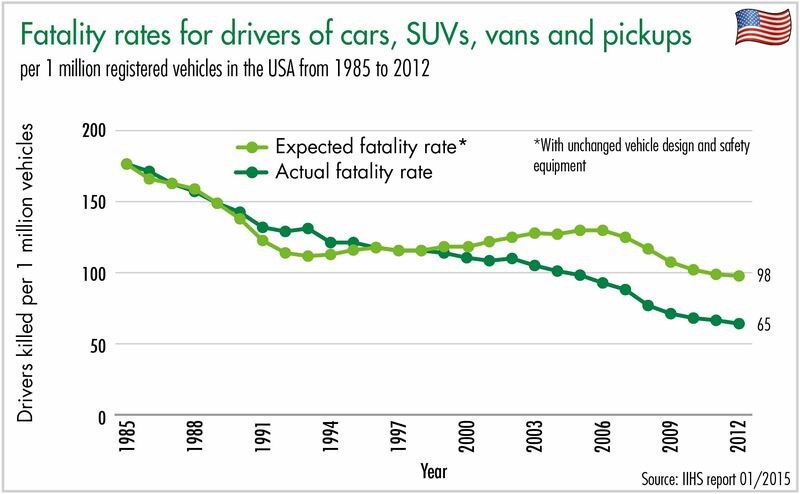 The difference between both rates in 2012 (65 against 98) can be largely attributed to improved vehicle safety. Had there been no such improvements in vehicle safety, around 7,700 (absolute) additional fatally injured drivers would have been expected in 2012.